Remove the yellow triangle from the Galaxy S2 after Root with ICS. Yesterday was made ​​available to the new distribution of Android Ice Cream Sandwich for the Galaxy S2, as in Italy still has not been officially released via Kies and many of you have already wanted to install it via Odin and make the Root as described in the Installation Guide and the Root of ICS on the Galaxy S2 . 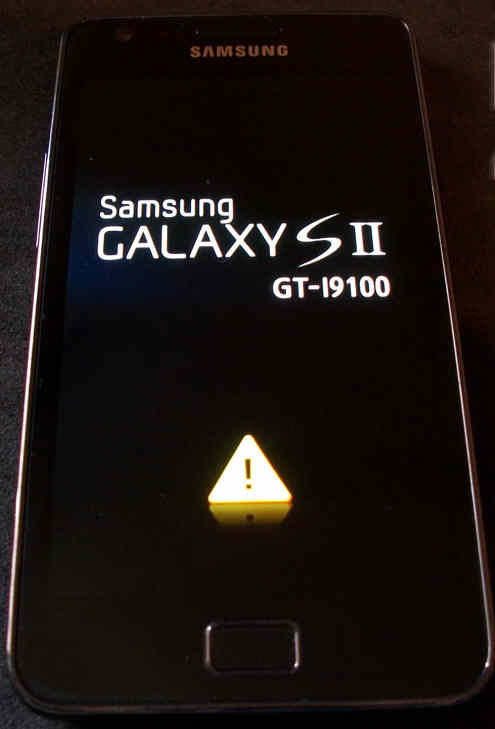 As you'll notice after Root on your GS2 each time under the word Samsung you'll see a yellow triangle with an exclamation point. Do not worry it's nothing serious, just the Bootloader of Samsung recognizes if you have installed a ROM through unofficial channels Official Samsung and then installing it via Odin you have broken this rule. Once there was a Jig that the Bootloader cleared it by removing the triangle but it is now even easier. To remove that annoying, that absolutely does not affect the operation of the device, just use a yellow triangle Simple Application available in the Market. The program is Away Triangle and has the requirements, of course, to have the Root.Simply install the program, Start it (Confirm the Model and Quantity of ROM installed) and click on "Reset Flash Counter". You will find that the Restart the annoying Triangle is no longer appear again. Obviously it is only compatible with Galaxy S2 (i9100) with Ice Cream Sandwich installed and not Gingerbread.